Do you want to record your voice, system sounds, or streaming audio on Mac? The best way to do this is to use audio recording software for Mac. 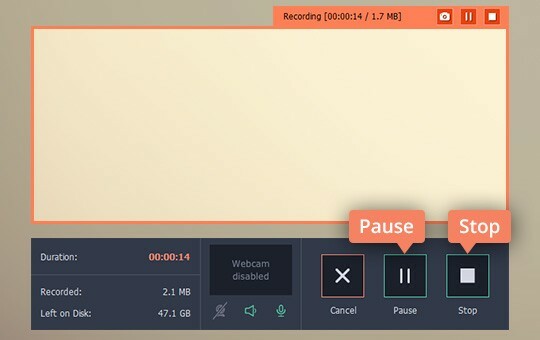 You can use an advanced video and audio recorder for Mac, such as Movavi Screen Recorder Studio, or a more specialized sound recorder for Mac. You can also use the recording tools included in programs originally designed for other purposes. 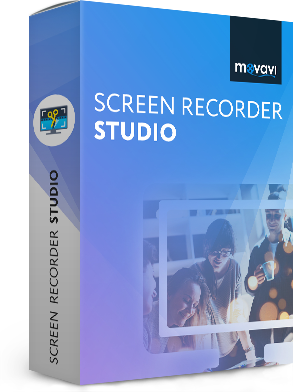 If you want to capture audio on your Mac and be able to edit it afterwards, try Movavi Screen Recorder Studio. This app is perfect for recording audio from any source, as well as screen video. You can trim the length of the recorded audio track, change volume and tempo, remove noise, and add various audio effects. 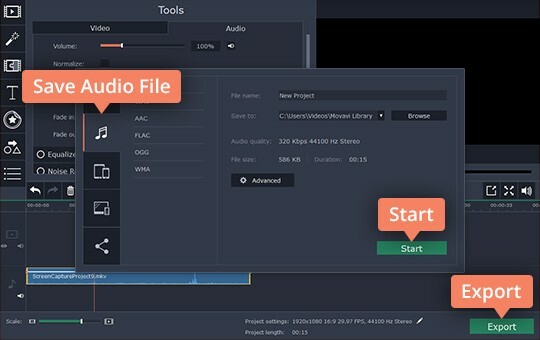 Save your recording in MP3, WAV, FLAC, and other popular audio formats. Below, you’ll see how to record audio on MacBook Air, MacBook Pro, and other Apple computers with the help of Movavi Screen Recorder Studio. Download Movavi Screen Recorder Studio, launch the downloaded file, and follow the instructions on your screen. Run the program and click Record screen in the launch window. In this mode, you can record sound as well: system audio, music from third-party websites, or a microphone. If you want to capture microphone input only, choose the Record audio option. Please note that we’re only explaining how to record audio using the Record screen mode here. After clicking Record screen, you’ll see a capture window with a recording frame. You won’t need this frame to record audio. Just make sure the System Audio button is activated if you want to record any audio from your computer. If you want to capture sound from a microphone, enable the Microphone button instead. Get ready to start playing the audio you want to capture and click REC. You can manage the process by clicking the appropriate buttons on the recording panel. You can also use hotkeys: ⌥ ⌘ 1 to pause and ⌥ ⌘ 2 to stop. You’ll see a preview window where you can replay and adjust the length of your audio recording. This track was recorded along with screen activity, but you can save it as just an audio file. To do this, click Save As, select MP3 in the export window, and click Save. If you want to edit your audio or save it in a format other than MP3, click Open in Editor and go to the next step. To start editing the audio recording, select the audio track on the timeline and double-click on it. Adjust the settings on the Audio tab: change volume and tempo, reverse audio, fine-tune the equalizer, remove noise, or add audio effects. When you’re ready to save the results, click Export. In the export window, open the Save Audio File tab, select the desired format, and click Start. You can also capture screen video and edit it afterwards with the help of Screen Recorder Studio. 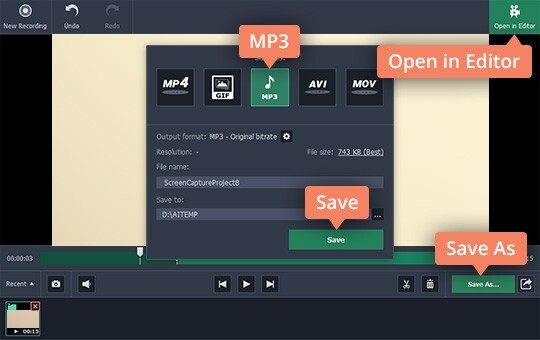 This program can be used for many different tasks, from recording audio to creating entire screencasts. There are programs designed for working with audio only. Audacity is one of them. You can use it to record audio on Mac and edit the result, but you can’t use it with video. 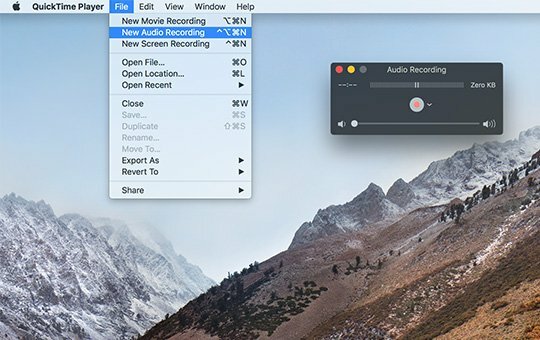 The program may be all you need if you capture your voice or record MP3 on Mac regularly but never record from your computer screen. To record your voice with Audacity, run the program, select your microphone from the Recording Device list on the main toolbar, adjust the sound level using the slider at the upper right corner, and click Record. Unfortunately, it’s less easy to record music on Mac with Audacity, as you have to work through a complex web of system settings to enable system audio recording. But if you have successfully prepared your Mac for sound capture, run the program and select Built-in Input on the Device toolbar. Open the Transport menu and make sure that the Software Playthrough option is not checked. Now you can start recording audio using the panel at the top of the program window. You can also record your voice using programs primarily designed for other tasks, like the QuickTime player. 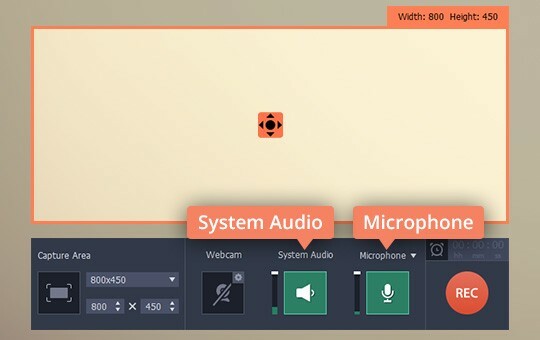 It lets you easily capture microphone output, but it can’t record audio on Mac: from the Internet, online radio, movies, music videos, or other sources. 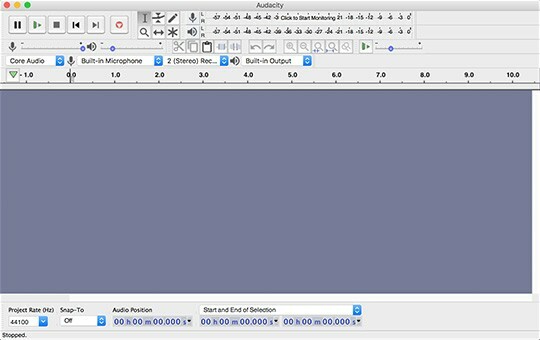 To use QuickTime as a voice recorder for Mac OS X, run the program, open the File menu, and choose New Audio Recording. A new recording window will appear. Click on the small down arrow to select the recording device and hit the Record button. When you click Stop, the recording will be automatically saved on your desktop in MOV format. *For this article, we used Movavi Screen Recorder Studio 9, Audacity 2, and QuickTime 7.